The people living along the West African coast at Elmina around the fifteenth century were presumably Fante. The Fante ethnicity bears an uncertain relationship to "Akan," itself a word connoting originality from the root word, "kan", to be first or original. Among their ancestors were merchants and miners trading gold into the Mediterranean and Near Eastern worlds from medieval times. The ancestors of the Akan-speakers of the forests however undoubtedly came from north of the forest. The people on the West African coast were organized into numerous populations that were drawn according to kinship lines. Family was extremely important in society, and family heads were united in communities under a recognized local authority. Along the Gold Coast alone, more than twenty independent kingdom-states existed. Elmina lay between two different Fante kingdoms, Fetu and Eguafo. West Africans nurtured ancient connections to other parts of the world. Common metals trade, iconic artistic forms, and agricultural borrowing show that trans-Saharan and regional coastal connections thrived. The Portuguese in 1471 were the first Europeans to visit the Gold Coast as such, but not necessarily the first sailors to reach the port. The Portuguese first reached what became known as the Gold Coast in 1471. Prince Henry the Navigator first sent ships to explore the African coast in 1418. The Portuguese had several motives for voyaging south. They were attracted by rumors of fertile African lands that were rich in gold and ivory. They also sought a southern route to India so as to circumvent Arab traders and establish direct trade with Asia. In line with the strong religious sentiments of the time, another focus of the Portuguese was Christian proselytism. They also sought to form an alliance with the legendary Prester John, who was believed to be the leader of a great Christian nation somewhere in Africa. 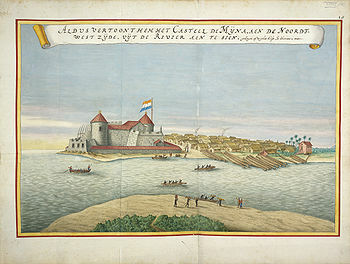 Elmina Castle viewed from the sea in 1572, by Georg Braun. 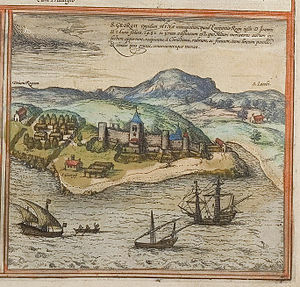 Notice Portuguese ships in the foreground and African houses/town shown the in left-hand corner and in various areas around the fort. Upon arrival, Azambuja contracted a Portuguese trader, who had lived at Elmina for some time, to arrange and interpret an official meeting with the local chief, Kwamin Ansah (interpreted from the Portuguese, "Caramansa"). Concealing his self-interest with elegant manners and friendliness, Azambuja told the chief of the great advantages in building a fort, including protection from the very powerful king of Portugal. During the meeting, Azambuja and Chief Kwamin Ansah both participated in a massive peace ritual that included a feast, musicians, and many participants, both Portuguese and native. Chief Kwamin Ansah, while accepting Azambuja, as he had any other Portuguese trader who arrived on his coast, was wary of a permanent settlement. However, with firm plans already in place, the Portuguese would not be deterred. After offering gifts, making promises, and hinting at the consequences of noncompliance, the Portuguese finally received Kwamin Ansah's reluctant agreement. When construction began the next morning, the chief’s reluctance was proved to be well-founded. In order to build the fort in the most defensible position on the peninsula, the Portuguese had to demolish the homes of some of the villagers, who consented only after they had been compensated. The Portuguese also tried to quarry a nearby rock that the people of Elmina, who were animists, believed to be the home of the god of the nearby River Benya. Prior to the demolition of the quarry and homes, Azambuja sent a Portuguese crew member, João Bernaldes with gifts to deliver to Chief Kwamin Ansah and the villagers. Azambuja sent brass basins, shawls, and other gifts in hopes of winning the goodwill of the villagers, so they would not be upset during the demolition of their homes and sacred rocks. However, João Bernaldes did not deliver the gifts until after construction began, by which time the villagers became upset upon witnessing the demolition without forewarning or compensation. In response to this, the local people forged an attack that resulted in several Portuguese deaths. Finally, an understanding was reached, but continued opposition led the Portuguese to burn the local village in retaliation. Even in this tense atmosphere, the first story of the tower was completed after only twenty days; this was the result of having brought so much prefabricated building materials. The remainder of the fort and an accompanying church were completed soon afterward, despite resistance. 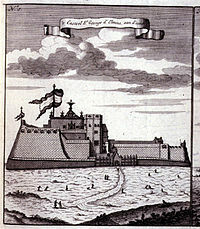 "The Castle of St. George d'Elmina, one side of it" in 1704. 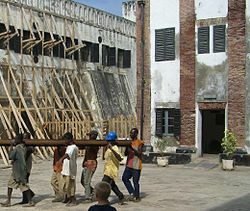 The fort was the first prefabricated building of European origin to have been planned and executed in Sub-Saharan Africa. 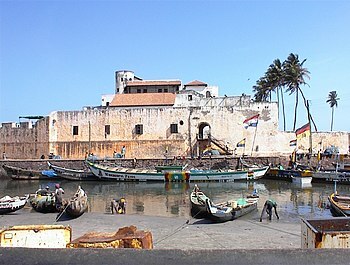 Upon its completion, Elmina was established as a proper city. Azambuja was named governor, and King João added the title "Lord of Guinea" to his noble titles. 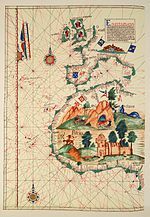 São Jorge da Mina took on the military and economic importance that had previously been held by the Portuguese factory at Arguim Island on the southern edge of the Moorish world. At the height of the gold trade in the early sixteenth century, 24,000 ounces of gold were exported annually from the Gold Coast, accounting for one-tenth of the world’s supply. The new fort, signifying the permanent involvement of Europeans in West Africa, had a considerable effect on Africans living on the coast. At the urging of the Portuguese, Elmina declared itself an independent state whose Governor then took control of the town’s affairs. The people of Elmina were offered Portuguese protection against attacks from neighboring coastal tribes, with whom the Portuguese had much less genial relations (even though they were friendly with the powerful trading nations in the African interior.) If any locals attempted to trade with a nation other than Portugal, the Portuguese reacted with aggressive force, often by forming alliances with the betraying nation’s enemies. Hostility between groups increased, and the traditional organization of native societies suffered, especially after the Portuguese introduced them to fire-arms, which made the dominance of the stronger nations easier. Trade with the Europeans helped make certain goods, such as cloth and beads, more available to the coastal people, but European involvement also disrupted traditional trade routes between coastal people and northern people by cutting out the African middlemen. The population of Elmina swelled with traders from other towns hoping to trade with the Portuguese, who gradually established a West-African monopoly. From the outset, the Portuguese authorities determined that São Jorge da Mina would not engage directly in the slave trade, as they did not wish to disrupt the gold mining and trade routes of its hinterland with the wars necessary to drum up slaves. Instead, the Portuguese had slaves shipped to São Jorge da Mina from elsewhere, notably the Slave Coast (Benin) and São Tomé. São Jorge da Mina served as a transshipment entrepôt. By the seventeenth century, most trade in West Africa concentrated on the sale of slaves. 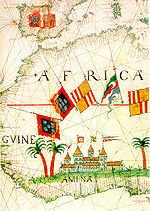 São Jorge da Mina played a significant part in the West African Slave Trade. The castle acted as a depot where slaves were brought in from different Kingdoms in West Africa. The slaves, often captured in the African interior by the slave-catchers of coastal peoples, were sold to Portuguese and later to Dutch traders in exchange for goods such as textiles and horses. In 1596, the Dutch made a first unsuccessful attempt at capturing the castle, succeeded by a successful one in 1637, after which it was made the capital of the Dutch Gold Coast. During the period of Dutch control, new, smaller fortress were built on a nearby hill to protect St. George Castle from inland attacks; this fort was called Fort Coenraadsburg. The Dutch continued the triangular Atlantic slave route until 1814, when they abolished the slave trade, pursuant to the Anglo-Dutch Slave Trade Treaty. The slaves were held captive in the castle before exiting through the castle’s infamous “Door of No Return” to be transported and resold in newly colonized Brazil and other Portuguese colonies. Up to 1,000 male and 500 female slaves were shackled and crammed in the castle’s dank, poorly ventilated dungeons, with no space to lie down and very little light. Without water or sanitation, the floor of the dungeon was littered with human waste and many captives fell seriously ill. The men were separated from the women, and the captors regularly raped some of the helpless women. The castle also featured confinement cells — small pitch-black spaces for prisoners who revolted or were seen as rebellious. Once the slaves set foot in the castle, they could spend up to three months in captivity under these dreadful conditions before being shipped off to the New World. An environment of harsh contrasts, the castle also had some extravagant chambers, devoid of the stench and misery of the dungeons only a couple of meters below. For example, the governor's and officers’ quarters were spacious and airy, with beautiful parquet floors and scenic views of the blue waters of Atlantic. There was also a chapel in the castle enclosure for the officers, traders and their families as they went about their normal day-to-day life completely detached from the unfathomable human suffering they were consciously inflicting. In 1872 the British took over the Dutch territory and the fort pursuant to the Anglo-Dutch Sumatra treaties of 1871. The castle was extensively restored by the Ghanaian government in the 1990s. Renovation of the castle continues. Today, Elmina’s economy is sustained by tourism and fishing. Elmina Castle is preserved as a Ghanaian national museum and the monument was designated as a World Heritage Monument under UNESCO in 1979. It is a place of pilgrimage for many African Americans seeking to connect with their long lost heritage. [dead link] The bridge leading into the castle was one of the highest priority tasks in the project. As of August 2006, the bridge renovation has been completed and construction on the upper terraces continues. ^ "Elmina Castle - Castles, Palaces and Fortresses". www.everycastle.com. Retrieved 2018-10-16. ^ Centre, UNESCO World Heritage. "Forts and Castles, Volta, Greater Accra, Central and Western Regions". whc.unesco.org. Retrieved 2018-10-16. ^ "Elmina Castle - Ghana". ElminaCastle.info. Retrieved 2018-10-16. ^ "Elmina castle Ghana". www.ghana.photographers-resource.com. Retrieved 2018-10-16. ^ a b c The Portuguese In West Africa, Cambridge University Press, 1950, p. 93. ^ Lawrence, A.W. (1963). Trade Castles & Forts of West Africa. London: Jonathan Cape. p. 36. ^ Filou, Emilie. "A pilgrimage to Ghana's slave forts". Retrieved 2018-10-16. Andrea, Alfred J and James H. Overfield. “African Colonialism,” The Human Record: Sources of Global History, Fifth Edition, Volume 2. Boston: Houghton Mifflin Company, 2005. Claridge, Walton W. A History of the Gold Coast and Ashanti, Second Edition. London: Frank Cass & Co. Ltd, 1964. Daaku, Kwame Yeboa. Trade & Politics on the Gold Coast 1600–1720. London: Oxford University Press, 1970. DeCorse, Christopher R. An Archaeology of Elmina: Africans and Europeans on the Gold Coast, 1400–1900. Washington, DC: Smithsonian Institution Press, 2001. Pacheco, Duarte. Esmeraldo de situ orbis, c. 1505–1508. 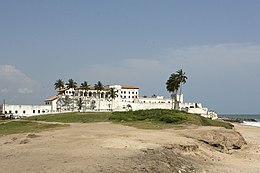 Wikimedia Commons has media related to Elmina Castle.